710 Genetics - 710 Gum. Free US delivery. To create 710 Gum we stabilised The BubbleGum strain originally developed by growers in Indiana, USA, for it's best characteristics; it's fruity aroma, thick lingering flavour and compact stature. 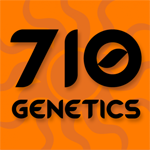 710 Gum is a true quality breed and has been used to develop award winning hybrids. With an optimum THC level of around 17%, this Indica dominant cannabis strain has been a great addition to the 710 Genetics breeding program.